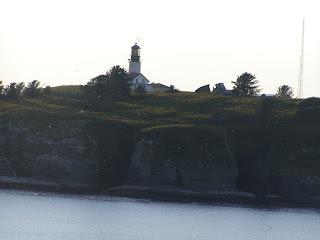 Last week, Lee Cowan of NBC and The Today Show did a very nice piece on Cape Flattery -- with a few exceptions. First, he stated not to expect fine hotels or nice restaurants anywhere "out here." Now we understand that the hosts and correspondents of The Today Show are probably accustomed to room service and valet parking. Maybe Lee didn't realize that once you veer off-the-beaten-path you have to know where to stay and where to eat. So with all due respect, we're here to set the record straight. 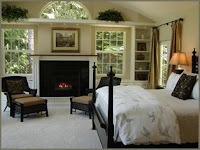 As for places to stay, we'll put our suites up against fine luxury hotels anywhere -- and we're right here on the Olympic Peninsula just 1.5 to 2 hours from the Cape Flattery Trail depending on how fast you want to drive the winding coast road that is one of America's newest Scenic Byways. The Lodge is located on a 9-acre National Wildlife Federation Certified Wildlife Habitat of idyllic ponds, sunny meadows and mountain views. There are no street lights, no telephone poles, no sirens wailing all night long. Just a babbling brook and a symphony of frogs. But secluded does not equal rustic. In fact, every suite here at the Lodge features a fireplace, vaulted ceilings, King-size pillow-top bed with European linens and down comforters, 32-inch widescreen, flat-panel HDTV-DVD, CD player, air-conditioning (that's rarely needed), microfiber resort robes, luggage racks, built-in hair dryers, fine botanical toiletries and free Wi-Fi. All those things that you expect to find in a fine hotel -- and then some. For example, we wondered if luxury resorts in those other places line-dry and iron their 600-threadcount sheets by hand? You just can't duplicate that fresh smell of sheets that have hung out in the sun to dry! Do those fine hotels back in civilization bring a welcome tray of free wine & hors d'oeuvres to your room at check-in? Do they include full hot gourmet breakfasts with complimentary lattes, mochas and cappuccino in their room rate? How about free movies (do they by chance provide the popcorn)? Evening turn-downs with fresh-baked treats on the bedside table? How about free hot & cold beverages anytime? Unlike those fancy resort hotels, we don't charge $4.00 for a bottled water or soft drink. Beverages from pomegranate green tea to Diet Pepsi are FREE for our guests to help themselves anytime just as though they were a guest (imagine that). That's how we spell hospitality here in this remote corner of the Pacific Northwest. Now for food. We could have sent Lee and his NBC crew to some amazing farm-to-table bistros featuring fresh Olympic Coast cuisine. We're talking line-caught Halibut broiled to perfection and served with a citrus salsa on the side, or fresh wild Pacific Chinook salmon roasted on an alder plank in the coals of a wood-fired grill, or tasty Quilcene oysters delicately pan-fried in a tempura batter and served with an aioli-pesto. We're talking fresh organic beet salad on wild greens (with three different colors of beets) drizzled with a champagne & toasted walnut dressing. 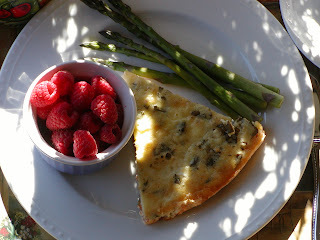 Oh, and then there are the incredible berries -- starting with strawberries in June, followed by raspberries, huckleberries, blueberries, marionberries, olallaberries and blackberries. Yes, we could teach you a thing or two about how we use those berries for everything from Lemon Ricotta pancakes with fresh raspberries for breakfast to melt-in-your-mouth blackberry & nectarine cobbler for dessert. Mr. Cowan, there are restaurants here that would knock your socks off . . . but they are not the tourist places and they are not on the beaten path. Which brings us back to Cape Flattery and that exquisite ends-of-the-earth trail. 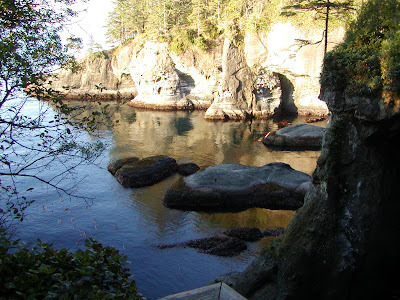 In fact, the signature photo at the top of our Blog is one we took from Cape Flattery. We were standing at the end of the boardwalk trail above rugged cliffs and sea caves looking across the Straits of Juan de Fuca toward the mountains on west Vancouver Island. Yes, those are clear, bright blue skies in that photo taken on a typical sunny day that you find here on the Olympic Peninsula throughout July and August. 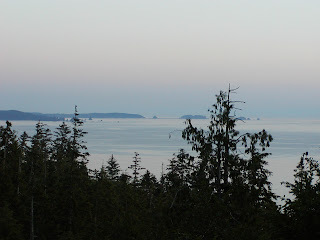 [The photo at left was taken at dusk on the same day looking South toward the headlands of Shi Shi Beach.] What many of our guests find most surprising is that fewer than a dozen cars might be found at the trail head on a beautiful summer day. In fact, it is precisely that remoteness, that unspoiled wilderness which makes the Cape Flattery Trail so exhilarating. Finally, Lee failed to mention the Makah Museum at Neah Bay (on the entrance road to Cape Flattery). Most people drive right by the museum without stopping. But inside the museum, you'll find amazing artifacts from the most prolific archaeological dig in North America. In fact, it's a bit of a Pompeii story -- without the volcano -- but with an entire "city" buried for centuries. We'll save that story for another Blog. So Lee, we beg to differ with your opinion on the subject of fine lodging and dining on the North Olympic Peninsula. However, it was wonderful to see the genuine surprise and wonder on your face when that big gray whale broke the surface and spouted right in front of your small skiff. The sound of the largest mammal on earth taking a breath is indescribable. It's a sound guaranteed to take even the most travel-jaded human's breath away! And that's only a glimpse of the wonders in this place we call home.